A year ago, thanks to an introduction from James Beard House EVP Mitchell Davis, I visited the R. Murphy knife factory for an in-depth tour and a look at how their fine, hand-crafted knives are produced. You can read about our visit and peek behind the scenes. 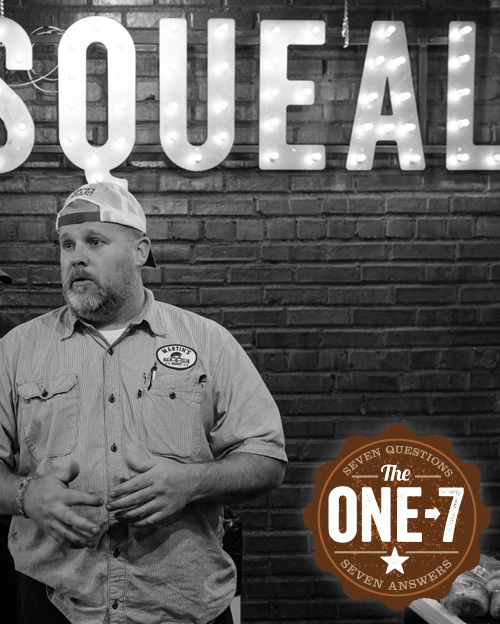 17th Street shares many similarities and philosophies with this storied, family-owned company and the owners, Mimi Younkins and Mark Furman, and I bonded immediately. Mimi and I became so excited about the idea of partnering on this project. We tested various knives to find our favorites, and Mimi was kind enough to send us additional knives to use for Block Party prep, so we’d have plenty for all of our volunteers. And then a year quickly passed. Now, here they are, just in time for Fathers’ Day. 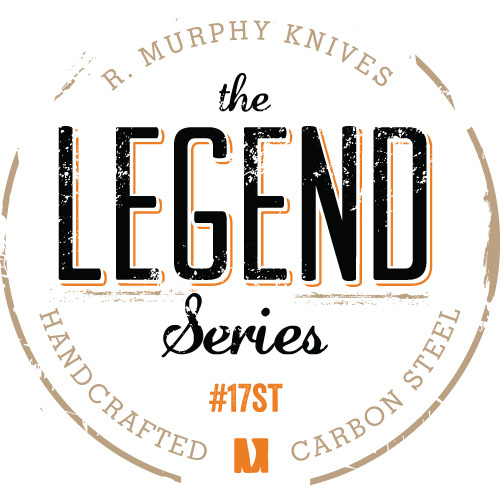 The Legend series, a set of four, carbon steel, super-sharp, meticulously crafted knives, etched with Mike’s signature. These are the staples of our kitchen – the ones Mike, Phillip, and I have in our knife kits and use in our restaurants and in competition for all types of meat and food prep. These are high-performance carbon steel knives. These high-quality knives are made with carbon steel blades for high performance. Carbon steel takes an edge much better than stainless steel and edge retention is superior to stainless. Carbon blades resharpen easily – a couple swipes and you are back in business with a super-sharp edge. 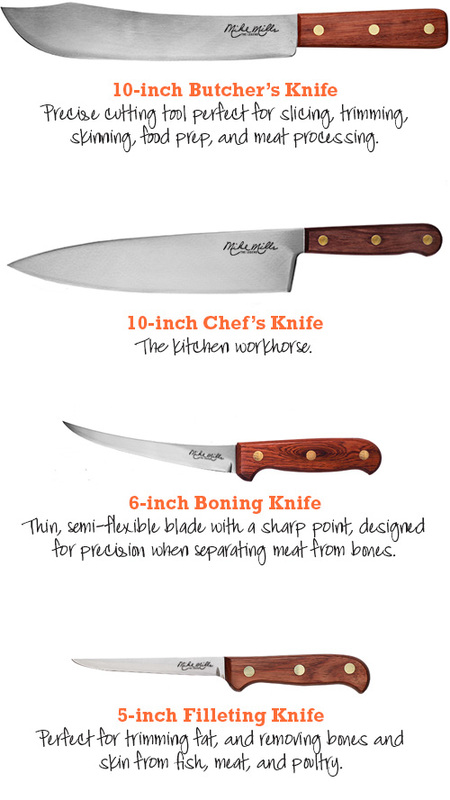 Performance is why chefs love carbon steel knives. Julia Child was a huge fan of carbon. In addition to being made from high quality carbon steel, each R. Murphy knife goes through the following important steps – resulting in a beautiful knife with a superior, long-lasting edge. Made from high carbon steel (1095), the blade is precision ground, hand-edged and hand-honed. Additionally, each blade is cryogenically treated, substantially increasing edge retention. Full tang construction for perfect weight and balance. Triple brass riveted Honduran rosewood handle – beautiful and durable. Infused with a wood stabilizer, handles are then hand polished to a high luster. Contoured handles are designed for comfort and a variety of grips. Following assembly, each blade goes through a final buffing process, giving the knife its superior, razor-sharp, long-lasting edge. Carbon steel knives require a little extra care. Like a cast iron skillet they must be kept dry or they’ll rust. Simply hand wash and dry your knives before putting them away. With proper care, carbon steel knives develop a blue-gray patina due to natural oxidation. This patina helps protect against further oxidation and is the sign of a chef’s favorite knife. This heirloom-quality set costs $350 plus shipping/sales tax. They must be pre-ordered via this link. We are producing a limited number of sets at this time. Orders must be received by April 25 to ensure delivery for Fathers’ Day.